FARMVILLE, Va., July 27 In the preface to the book “Invading the Sacred: An Analysis of Hinduism Studies in America,” the Birks Professor of Comparative Religion at McGill University, Professor Arvind Sharma lays it out all and best about the decade-old public spat between a grass-roots group of mostly Indian-American citizens and the well-entrenched and powerful group of Western academics in elite American universities. The spat deals with the description, analysis and symbolism of Hindu deities and sacred texts, as well as of Hindu ritual, worship and beliefs. The tale in this nearly 550-page book is at once complex and simple. It started with Rajiv Malhotra discovering a Freudian analysis of the most popular Hindu deity, Lord Ganesha, in Paul Courtright’s book “Ganesa: Lord of Obstacles, Lord of Beginnings”. It is not important or even necessary to go through the series of essays, articles, letters to the editor, readers’ comments, etc. (running to the tens of thousands of pages) about the book and the controversy it generated to get a handle on the nature of the controversy. One can easily get lost in the byways of tangential arguments and personal spats if s/he were to sift through the enormous material on the Internet about this issue and the varieties of personalities involved in it, including me. In fact, I get credit in the book as a contributor, as I have written the introduction to Dr. Alan Roland’s essay, and because my essays in the Indian-American newspaper India Abroad have been summarized in the book. The book helps the novice reader by summarizing the issue in a fairly cogent manner. It shows that the gratuitous sexualizing of the symbol and deity of Lord Ganesha (of the elephant head) – and proposing that Lord Ganesha’s trunk symbolizes a limp phallus – is an example of the far-fetched, idiosyncratic and puerile “analyses” that crowd the pages of so much of modern literary criticism, cultural studies and religious studies textbooks and journals. Rajiv Malhotra, who started the Infinity Foundation, and who wishes to bring to the study of Indic traditions the same clout, heft and influence of China studies, came out with guns blazing and tried to reverse the gaze of the Western academic, arguing that these scholars themselves should be put under the Freudian lens because they marketed their peccadilloes and their fetishes by masking them in scholarly jargon. In the age of the Internet, the public space has been truly democratic and is wide open for a variety of voices – the angry and the sedate, the sane and the ludicrous, the intelligent and the ignorant, the wise and the foolish — like at no other time in history, and there were some angry, rude and bullying exchanges which Paul Courtright, Wendy Doniger and some of their colleagues characterized as violent. This was countered by Professor Antonio de Nicolas, one of the editors of “Invading the Sacred,” who refuted the argument about academic freedom, pointing out that “The first responsibility of a scholar in describing, writing, speaking, and teaching other cultures is to present those cultures or the elements of those cultures in the same manner those cultures are viewed by themselves and by the people of those cultures. If not, then the scholar is using those cultures in name only and his goal is their destruction, if not in intention at least in fact. A scholar who does not know how to present other cultures by their own criteria should not be allowed to teach those cultures. His freedom of speech is not guaranteed by his ignorance. His degree is a privilege of knowledge, not ignorance. Freedom stops here. Opinions are not the food of the classroom at the hands of professors. They guarantee knowledge.” When I quoted this statement in an essay I wrote for India Abroad, Professor Martha Nussbaum claimed in an essay in The Boston Review that I was a Hindu militant who wanted Courtright to stop teaching! She wrote: “For writing this book 20 years ago, Courtright has recently received death threats; even the public face of the opposition is extraordinarily threatening, including prominent claims in periodicals as respectable as India Abroad that Courtright’s academic freedom should be revoked and that his university (Emory) should not allow him to teach.” Such circling of the wagons by powerful and influential academic and media voices was not unexpected and showed how uneven the field still is. Why get angry about this interpretation when we have allowed our artists to dunk a plastic icon of Jesus in urine and use elephant dung to draw a picture of the Virgin Mary, seems to be the argument of free speech advocates and scholars at one level, and at yet at another level they claim “authenticity and rigor” for their Freudian and idiosyncratic interpretations of others’ religious symbols and texts: so, what is it? Freedom of speech, or rigorous and authentic scholarship? Professors Doniger, Courtright and others and their sympathetic supporters have not had to deal with “insiders” till now. However, million Indian-Americans, and many of them deeply educated and informed in their own faith traditions, but not belonging to or part of religion departments or who are literary critics, there had to be a confrontation sometime, and this book is all about that confrontation. 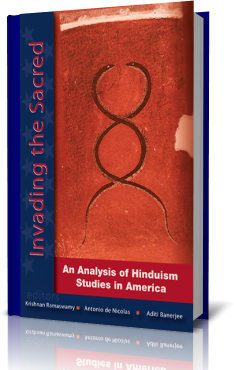 What has shaken the Western academics teaching and studying Hinduism is the gift and scholarship of their Hindu-American interlocutors. A good friend of mine, Vishal Agarwal, an engineer by training, and a self-taught Hindu and Indic traditions scholar, has deconstructed Courtright’s thesis, and shown that not only is the Freudian analysis unsubstantiated but that Courtright’s command over the Hindu texts and traditions is shaky. Courtright and his friends have not bothered to respond to the detailed critique by Agarwal. As a new and small immigrant community with a long, rich and powerful religious and cultural tradition, Hindu-Americans have begun to find their voice in their new home. That voice has been caricatured and characterized as uncivil, angry and even violent, because some of the Internet postings in response to the essays, especially by Rajiv Malhotra, are indeed uncivil and angry. However, those who claim that they feel threatened by all this are either ignorant of the free-for-all nature of cyberspace and the angry, shrill, violent postings of a variety of issues on a variety of sites by a variety of people or are deliberately trying to malign the Hindu-American community and muzzle the voices of the most influential in that community. For all those interested in the debates about religion, religious diversity, intellectual freedom, freedom of speech and related issues, “Invading the Sacred” should be compulsory reading. Ramesh N. Rao is professor and chair of the Department of Communication Studies and Theatre at Longwood University, Farmville, Va. The views expressed here are his personal views and not those of the institution to which he belongs. His email address is closepet@hotmail.com. © copyright 2007 by Ramesh N. Rao.